I took these two books north with me on retreat week, where I saw nowhere near as much snow as I'm seeing now. And nothing like my readers in the mid-atlantic states are seeing. 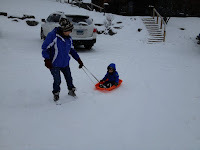 But those of us in New England know that there are many up sides to snow. One of them involves sleds. 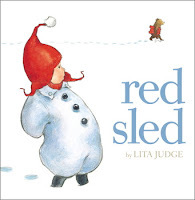 The only words in Red Sled by Lita Judge are the sounds various creatures make while enjoying a red sled whose young owner left it leaning against the house. A great narrative told only in pictures with a neat surprise ending. Read about sledding this weekend and then, when you're not shoveling snow, go out and do some. Though, quite honestly, when I was a kid, we called it sliding.